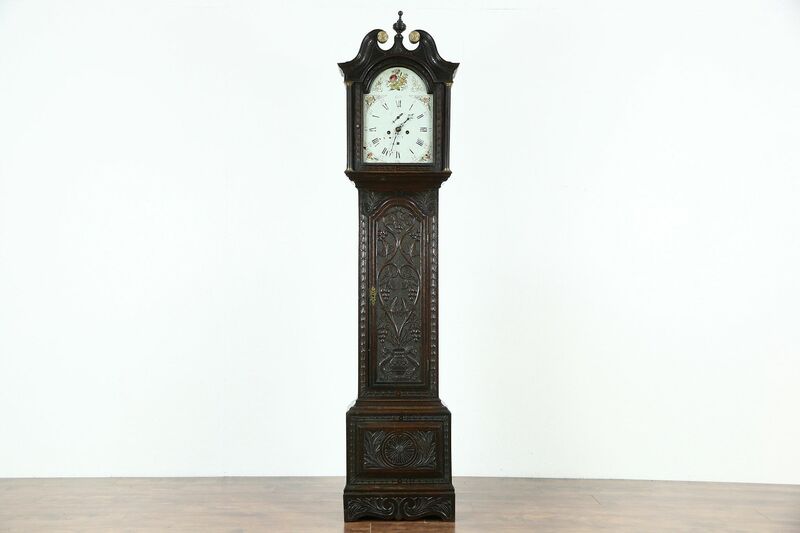 A wonderful Georgian period long case or grandfather clock was hand carved of solid oak for a country "Downton Abbey" type manor about 1820. The signature on the dial is visible with a black light, and reads "Tho. Ivory of Dundee." The fourth largest city in Scotland, Dundee is on the east coast near St. Andrews. The fine old finish is very well preserved and has been waxed and buffed, so all that is needed to maintain the warm patina is an occasional wipe with a soft dry cloth. There are shrinkage separations from age, see photos. The brass movement runs accurately for a week on a winding and operates a second hand and calendar dial. A bell strike counts the hours on this British antique clock. Hand painting is original on the iron dial, chips on the dial show that there is no later repainting. There is another signature, "Wilson" on the inside of one brass plate on the movement, so it would be seen by future clockmakers when oiling the mechanism. This could be a maker of the brass plates. The brass pendulum, iron weights and crank all appear original, the lower door locks. Measurements are 20 1/2" wide, 10" deep and 86" tall.